After a tumultuous morning making emergency plumbing repairs foodie Greg decided we’d try Pho Saugon, which had very good reviews on Yelp. Because it’s a known quantity, we had pork bahn mi. They were very, very good, probably the best bahn mi we’ve ever had. Sorry Mandolin Grill! We had plans to share the meal with a friend, but last minute unforeseen complications saw that meal postponed until tomorrow, so we had to make a last minute meal for ourselves tonight. 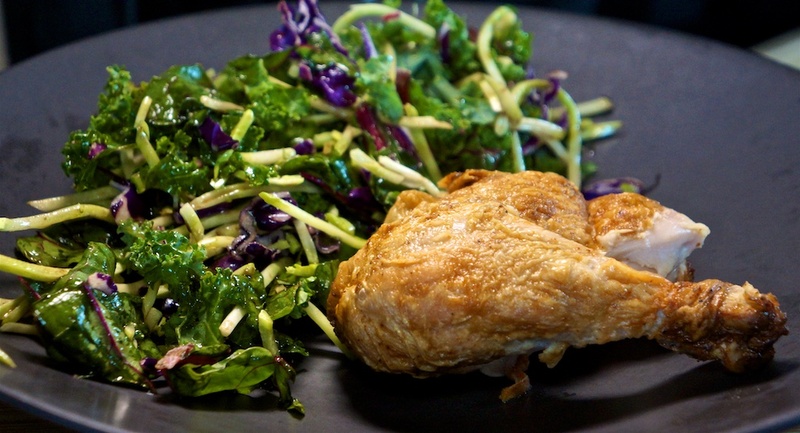 Fortunately we still had roast chicken legs and mixed salad greens, so chicken and salad was on the table in less than 10 minutes. Add 20c for olive oil and balsamic vinegar for a dressing. Tonight’s quick meal was tasty and cost $2.57 per serve. A great baguette from Jon’s over the hill in Simi Valley was cut and a quarter each filled with fresh roast chicken breast, avocado and sun dried tomatoes. It was a great combination and we thoroughly enjoyed it, although Philip thinks his was better because of a smear of mustard aioli. Add 12c for the mustard aioli. Lunch today was great for $2.60. Time to use up the remainder of the bolognese sauce! 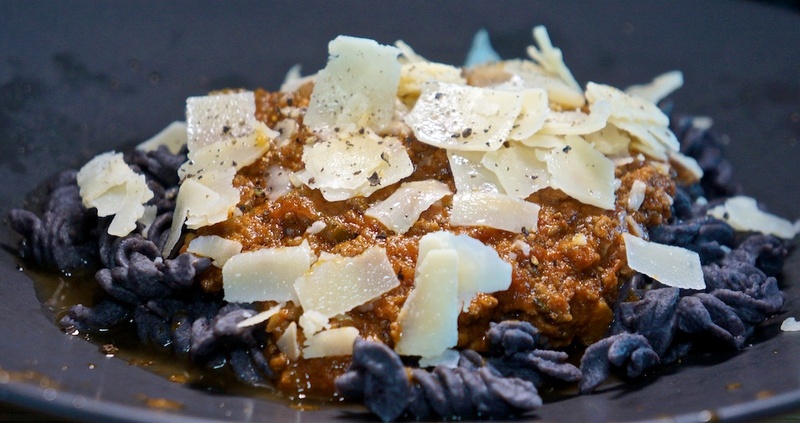 Tonight we paired with black bean rotini to create a dish worthy of Wednesday Addams! Shaved parmesan comes in a $5.49 pack, and we used 1/4 or 46c per serve. We used half a $2.99 packet of Trader Joe’s organic black bean rotini, or 75c per serve. Dinner tonight looked interesting, tasted great and cost $6.26 per serve. More shared mixed sandwiches: roast beef, mustard aioli and tabouli; cheddar and tomato relish. The cheddar is $5.99 per block and we used 1/4 or 75c per serve. Today’s lunch sandwiches were both good, for $2.23 per serve. 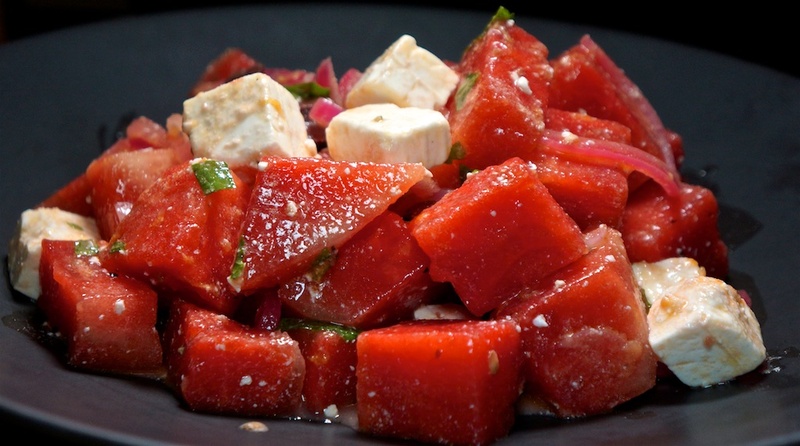 A beautiful night to eat under the stars, and what better than Nigel Lawson’s watermelon, feta and black olive salad. It’s a summer regular and very, very good. We made three serves from a small watermelon. This time we were able to get Valbreso French feta, which is definitely superior in flavor and texture than the lesser feta from more local sources. Dinner tonight cost $2.33 per serve. It’s an excellent dish and every time we serve it for someone, they want the recipe. A return to an egg salad with watercress sandwich, paired with a spicy tuna sachet sandwich. Both were shared. Lunch today cost $1.51 per serve. The first opportunity to cook on the new grill we assembled this morning, so we cooked Prather Ranch rib eye. We served it with a Kale slaw kit from Ralph’s (Kroger) and the most decadent onion, cream and blue cheese sauce, which is almost a side. Blue cheese crumbles are $3.49 for the pack but we used about 1/3 or 75c per serve. 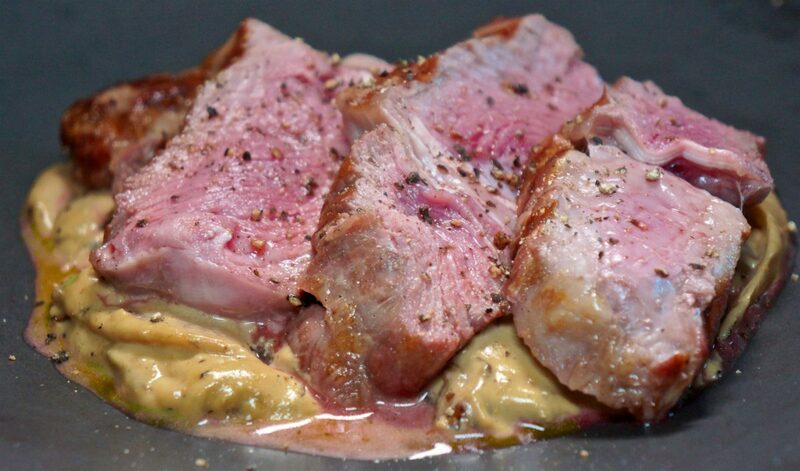 The rib eye was cooked to a perfect rare, the onion, cream and blue cheese sauce was beyond decadent with sweetness from the onion, a tangy bite from the blue cheese and that creamy mouth feel that made French cuisine so popular for so long, while the salad provided a balancing fresh crunch. A near perfect meal for $13.29 per serve. Lunch today was tasty but probably not one we’ll repeat, at $2.29 per serve. Tonight was our month LACPUG user group meeting followed by pizza afterward, for which were all contribute $5.00 per person. Time to finish the Popeye’s chicken – after reheating in the oven – by pairing it with a salad kit from Ralph’s. The kale, cabbage and dried cranberry salad kit was $2.99 and we used half for this meal, or 75c per serve. Although the weather is hot, our new North Terrace – our only outdoor living area – catches the breeze well and is cool enough for soup! The Dutch Mustard Soup was a hit last time we had it, so it was tonight’s choice again. Like a creamy, mustard version of French onion soup, this recipe is outstanding. The lardons of bacon on top give it a meaty flavor and texture, without dominating the dish. The onion and leek add sweetness, offset by the sharpness of the mustard, with the sour cream (in our version) moderating the flavors. The par baked roll was $2.99 normally, but this one was on run-out special for 99c, or 25c per serve. Dinner tonight was easy to prepare, delicious and only $2.43 with the bread! As we were planning on stopping at (the closing-this-week) Chatsworth Nursery Topanga location to buy plants for our new North Terrace, we first went past that location to The Country Deli for lunch. Foodie Philip had the marinated skirt steak with eggs and home fries, while Greg had the Pastrami on Rye with fries, although half the sandwich was retained for dinner. After such generous serves at lunch we felt something simpler and lighter would be good for dinner. Foodie Greg put together a simple salad of butter lettuce, pickled beets and shaved parmesan cheese, which was pretty good. The remaining half pastrami sandwich was quartered and served as the protein, with the cost included in lunch. Dinner added another 99c per serve to the day’s food bill, and was an appropriate meal for the day. To both get out of the house for a while, and to have a little food adventure, we drove to downtown Los Angeles to Bronzed Aussie for an Australian meat pie and sausage roll. While a lamb pie is not highly tradition this one, with Minced lamb braised in Madeira sauce, potatoes, carrots & peas, flavored with rosemary & garlic was particularly tasty for $10.90 or $11.81 with tax. We paired it with a homemade seasoned pork sausage rolled in very good puff pastry for $4.90 with tax. While not a cheap lunch at $16.71 per serve, they were excellent examples of their kind, and both pie and sausage roll had better pastry and more flavorsome interiors than any pie or sausage roll we could find in Australia last December. Before we went out for lunch, Greg started the bolognese sauce, which ultimately simmered for about six hours. We served with simple penne and shaved parmesan cheese for a simple, but fully flavored, dish. The sauce makes six good servings. With a dish like this the secret is to get great tomatoes and found low sodium Italian tomatoes at Trader Joe’s that bought real tomato flavor. The ground beef is from dry aged primals via our Prather Ranch meat delivery. 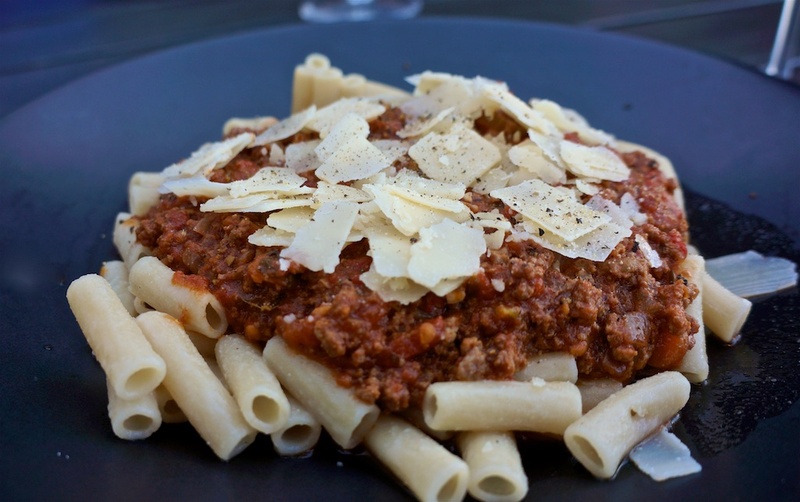 Tonight was an excellent example of a simple, but fully flavored bolognese sauce over penne with shaved parmesan for $6.18. It also marked the first night where the new ‘North Terrace’ was fully operational and ready for our first guest. A trip back from a class in Burbank came directly past a Popeye’s, so what were we to do? Half the Large Red Beans and Rice is $2.17 with tax, per serve. Lunch today cost $5.22 per serve. Another in a series of Cobb Salad variations, this time with smoked salmon as the primary protein. Feta cheese seemed like a better combination than blue or cheddar. This was an excellent salad. Add 20c for shredded iceberg. The feta in brine was $6.50 and 1/4 went into dinner, or 41c per serve. This is a great variation on a Cobb, and the feta was the right choice. A great mixture of salty, fresh, creamy and egg for $6.24 per serve. More sandwich experiments. The silverside (corned beef top round) was paired with spicy labné, which sounds unusual but was very tasty. For the other sandwich we opened a pouch of Thai style tuna and complemented it with some watercress. Both sandwiches were very successful and will be repeated. The tuna pouch is $1.50 o r 75c per serve. Lunch today cost $1.86 per serve. With the hot weather continuing, the focus remains on cold salads. 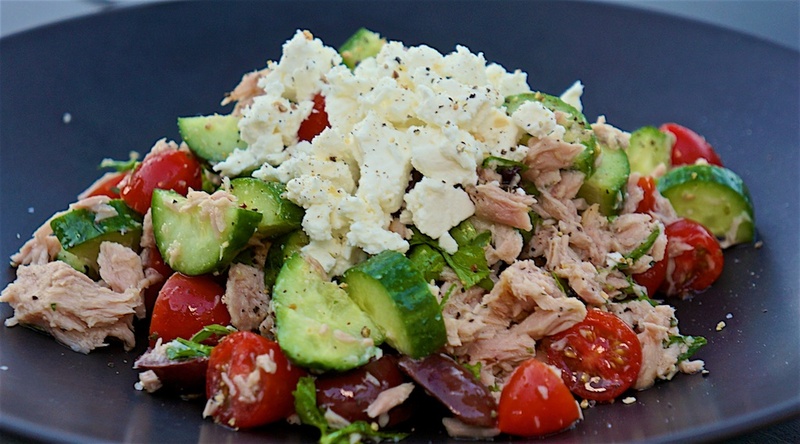 Since it was so successful last time, we returned to the Greek style tuna salad the we enjoyed last month. Tonight was also the first night the Foodies ate on the new outside terrace.